Grabbed you with that title didn't I? Psyche!!! You will have to wait to the end of this post. Back to the village, I have fallen way behind in featuring some of the things our village have made for Princess and Wildman. Wildman has outgrown every stitch of clothing he has in the past 6 weeks. Momma is about to lose her mind washing his two pair of pants everyday. Since I am up to my neck in new Baby Peanut I asked a friend to run up a couple of Children's Corner Johhny longalls for him. This is the close up of a royal blue pique longall and shirt. The shirt is piped with the same tattersall use to line the longall. A machine applique and self piping finish the look. Isn't that lining the cutest? He is going to be handsome. Another CC Johnny made from a ticking that has aged quite well in the closet. I am sure it is twenty years old. It too is self piped and lined with white broadcloth. You may remember these are both the same pattern I used for the Easter longall, except I had Judy take some length off the legs. Per Mommy's request, snaps in the crotch. 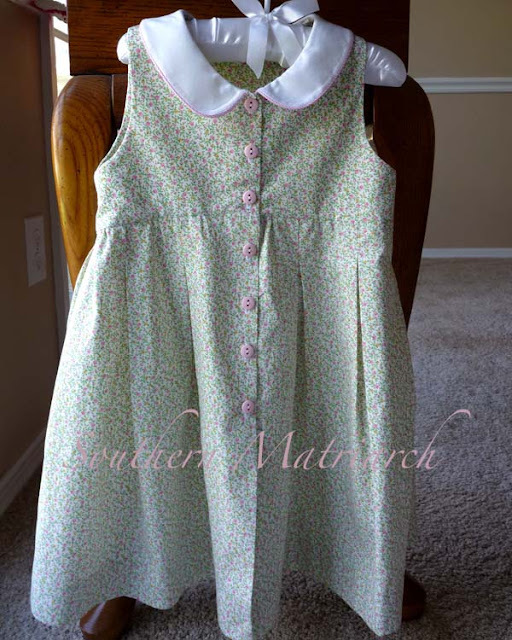 My friend Lori made this precious dress for Princess. It is Children's Corner Emily. It is from a floral pique. I didn't have this pattern and after seeing it, I had to order it. The waist is raised in the front. You can't see the pleats very well but it has soft pleats around the skirt. 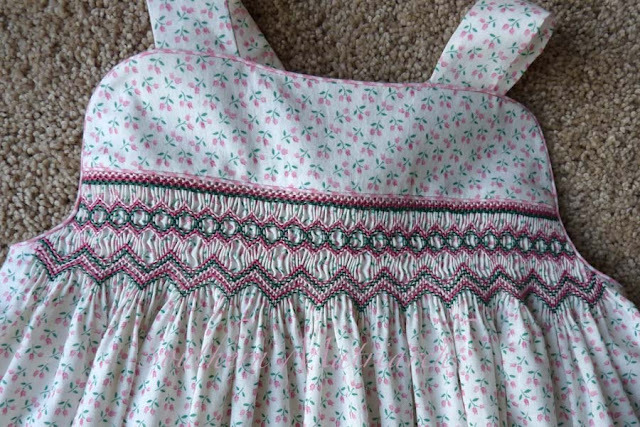 The collar is also pique, piped with pink gingham. So sweet. Spring has finally come where Princess lives, so this will be perfect for walks in the park or even lunch in an outdoor cafe. Not everything is from Children's Corner. 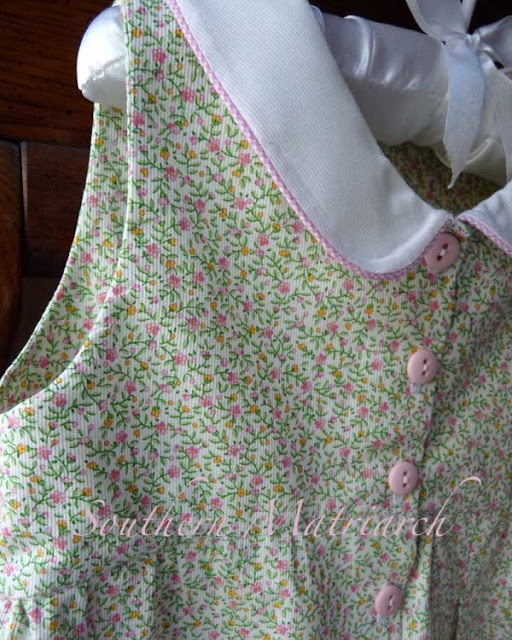 This precious sundress is Child of Nature from Australian Smocking and Embroidery Issue #53. The fabric is a small print floral. 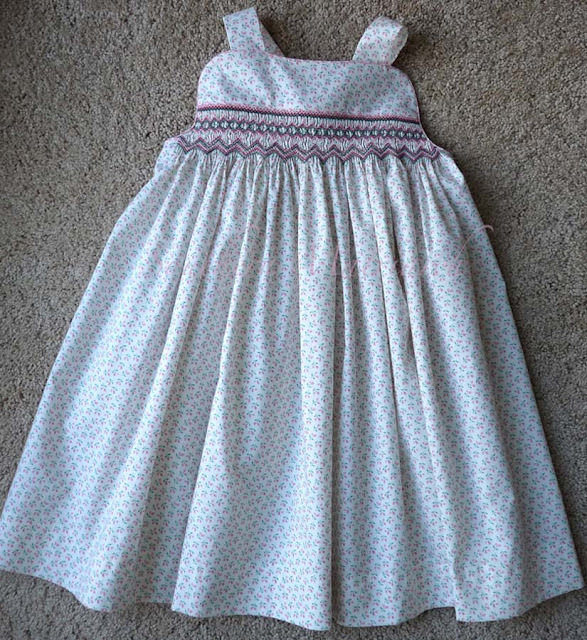 Rachel's smocking is perfection. The yoke and skirt are both piped with gingham as well. You can't go wrong with gingham. THIS baby is on its way to my house as we speak. Along with three lenses, tripod etc. I am excited. I conferred at length with my daughter, the family photographer. After much encouragement I clicked the "purchase" button. I am sure the secret to her great pictures is in the camera she carries. Just kidding! She really is talented and I am hoping I just can get a few pictures that are in focus. My goals are meager. Lets hope I can eventually take a picture without the "Auto" key. My brain is on overload trying to learn about ISO, Apertures and the like. A whole new language to me. Wish me luck. Spring has finally sprung here, DH was even coerced into cutting the grass for the first time. I think the green waves of grain look is what convinced him. 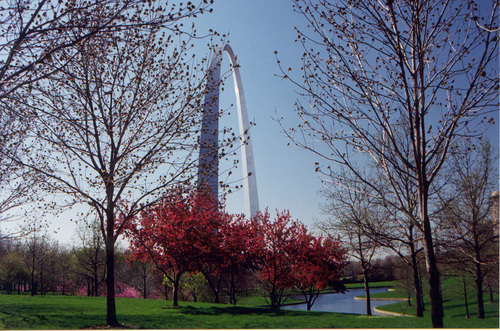 You could see the grass blowing in the wind today. It was wonderful to see hostas and hydrangeas beginning to peek out of the ground once the thick blanket of leaves was removed. 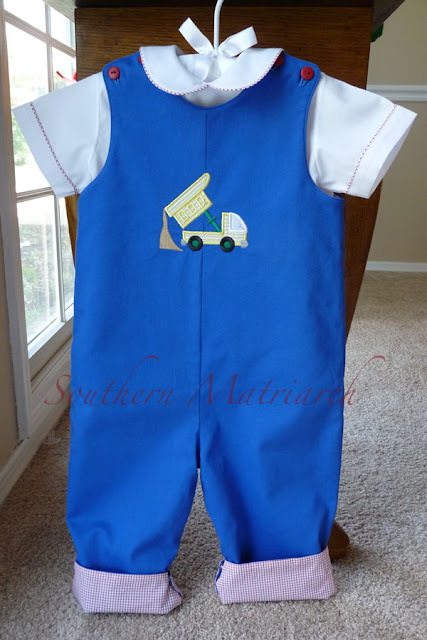 I am busy sewing, a couple of more weeks until the baby shower for Baby Peanut's Mommy. Until then you will just have to guess what I am up to. 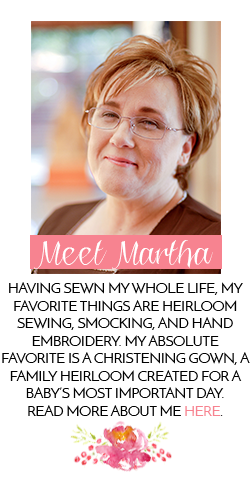 Beautiful work, Martha, as always. You certainly have been busy and Baby Peanut must be such an inspiration. Love the clothes, but I also love the camera, I have the same one. I share it with my 10 year old son. He knows more than I do about it. Autofocus is my friend. Have fun with it. Judy did a fabulous job, as always! Wildman will at least be very well dressed, while pulling his antics! I have always liked CC Emily, but it is often overlooked. This one is especially sweet. Cannot wait to see a Mimi-made version! 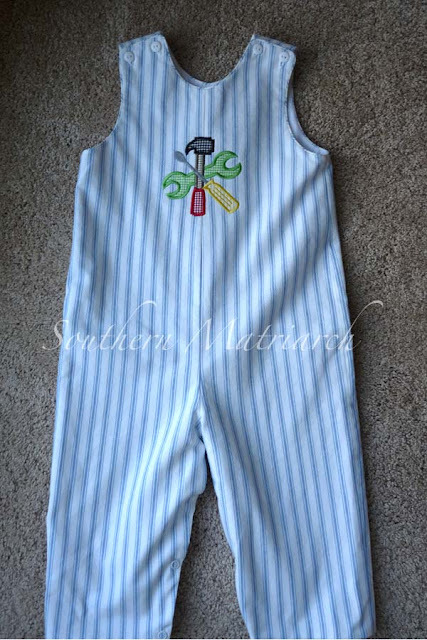 Have fun stitching for the new real baby, and playing with the new camera baby! 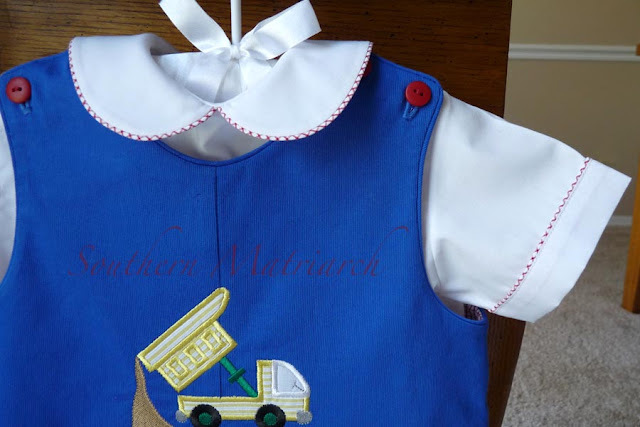 All the clothes are wonderful and I am sure the children will love wearing them. You have some special friends! I really love the smocked sundress from AS&E. I have made that pattern twice and just love it. It fits for more than one year, too, which is always a bonus! Everything is really cute. Rachel and Judy do fabulous stitching. I love CC Emily and I have it in the larger size range I love the little sleeve it comes with too maybe in a year or two I'll make one.